Pistachios on pizza?! No way! I thought the same thing when my husband brought it home from the pizza place. But between it, the sweet red peppers, and the pesto, it works. You must try it! This is my version. We came up with a fun name, it means Red Green Pizza in Italian. 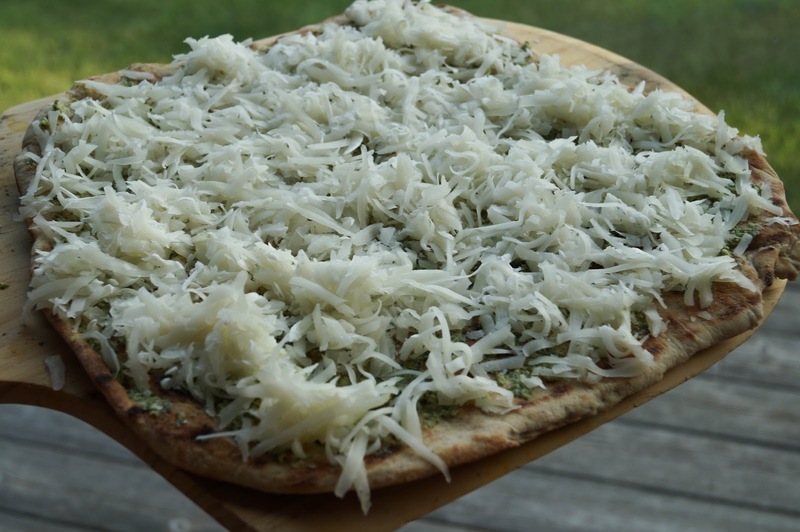 For this recipe I used pre-grilled pizza dough and cooked it in the oven. For fresh grilled pizza follow instructions on the grilled pizza dough page. 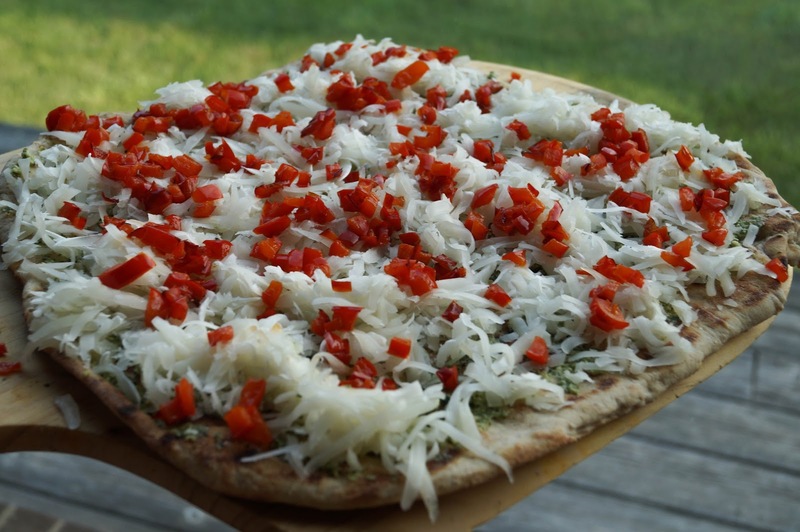 You can also use the quick pizza dough recipe and top it. Preheat oven and stone to 450 degrees. Place frozen pizza dough or rolled our fresh dough on a pizza paddle or flat cookie sheet. 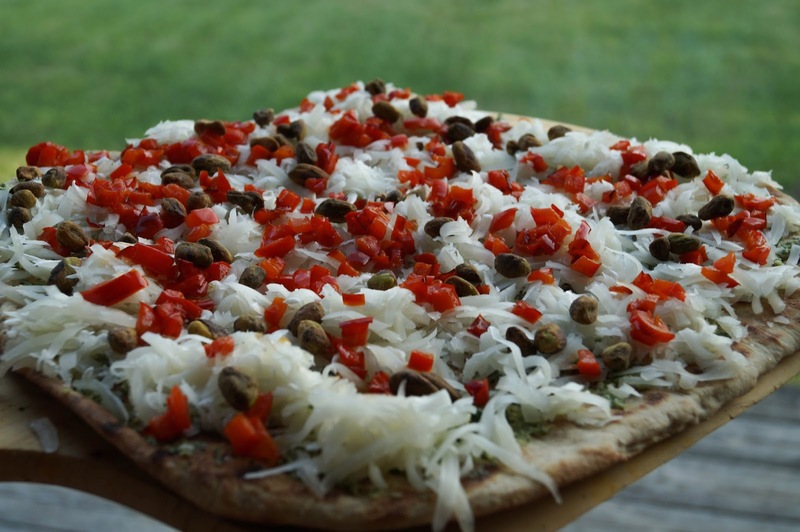 Frozen pizza doesn't need cornmeal, it won't stick but the fresh DOES. Spread on the pesto. Use as much or as little as you like. Sprinkled on your grated cheese. Now, on to adding the pistachios. We left ours whole but you could chop them up a little bit if you want but don't obliterate them. You want the crunch. Slide it onto the pizza stone. Bake for 8-10 minutes or until golden brown. Careful to watch your crust. Brown is nice but at the end can quickly be too brown. OMG this looks amazing!! I love any kind of pizza but whenever I make it at home the dough always scrunches up and it comes out so mushy! I'm going to try the frozen kind like you have here. Grilling the dough makes it almost taste like brick oven. The almost burnt browned parts are the best part! Give it a go! I think you won't be disappointed! Thank you for stopping by. It was pretty yummy! So sad I only had enough red pepper for one pizza or we would have made two. Wasn't much for leftovers! I know it sounds crazy but it's tasty! :D Thanks for sharing! Thank you. We were trying to be inventive so that is what worked. 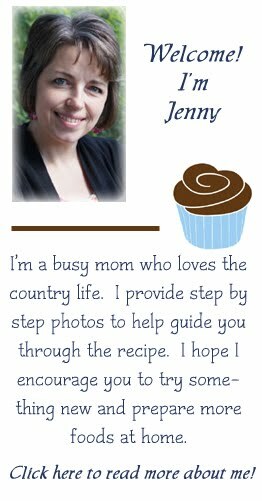 Congrats Jenny, this recipe was on of last weeks favorites from my readers. So it will be featured tonight on the blog link party. Hope you'll stop by again and link up. Awesome!! Thanks so much everyone!! 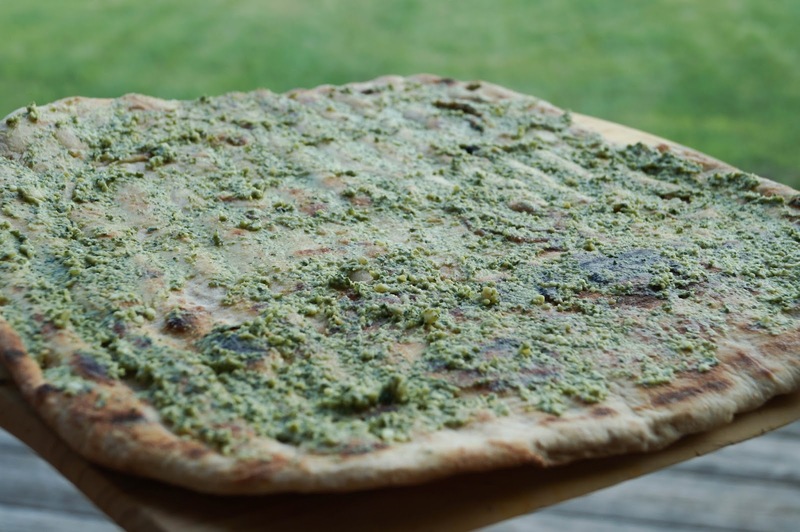 Huh - I never would have thought to add pistachios to pizza ... but now I feel like I've been missing something and need to try it! Pinning this, Jenny! I know it sounds crazy but it's tasty! Could got some of this right now! It's a crazy combo but so good! Yum, this looks good. Gonna have to save this for the summer!! Absolutely Beautiful Pizza! Love the thought of the flavor combinations. Cannot wait to try it! Featured on http://foodisloverecipes.com Pizza Party!